The Global World Order in place since the end of WWII is about to Collapse! 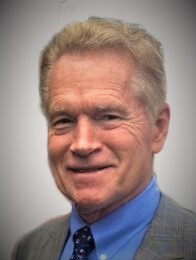 James Dale Davidson, world-renowned author, political, and investment analyst, who predicted the collapse of the Soviet Union, Donald Trump’s presidency and dozens of other major economic events is now predicting a landslide of disastrous political and economic events ahead that will financially devastate tens of millions of American families as the coming World Order status-quo collapses. James wants to make sure you don’t miss a single buy, or sell recommendation that he makes. Because if you do you could miss out on turning your nest-egg into a multi-million dollar fortune. This tremendous gain came about because while much of the world viewed Donald J. Trump’s presidential campaign as a distraction or a sideshow, a man whose connections run deep in Washington knew better. He knew Trump would win. And, he knew the exact investment that would generate breathtaking profits the morning after Trump won. That’s the morning his readers cashed in 4,100%... $5,000 instantly became $205,000. I am writing to you today because you are a serious investor who should immediately subscribe to James Dale Davidson’s Strategic Investment newsletter. Like many of James Davidson's predictions, this one leads ultimately to a 4,100% gain. In fact, throughout his long and esteemed career, it’s seemed as if James had a direct line to the future with forecasts that generated gains way beyond the pedestrian. This remarkable talent for spotting investable trends first is also what led his followers to cash in on a string of large gains last year… among those were 406% and 860%. But for now, let’s focus on the prediction that turned every $1,000 into $41,000… every $5,000 into $205,000. That predication was paired with a recommendation to short the Mexican peso based on then candidate Trump’s vitriolic rhetoric about Mexicans, Mexico, and NAFTA. What sets this forecast apart, however, is that this specific actionable prediction was made four months before Trump had even secured the Republican presidential nomination. Then, on November 9, the morning after the general election, the peso plunged, and Strategic Investment readers were on their way to one of the year’s top gains… 4,100%. Large returns based on contrarian forecasts are what readers have come to expect from James Dale Davidson. Asymmetrical Investing – an analytical model that exploits gaps, groupthink, and arrogance in the markets. He has penned an in-depth report on the ins and outs of Asymmetrical Investing, which I want you to have with our compliments… FREE today. In it, you’ll gain in-depth insights behind why the peso play was just one of many unconventional “bull’s-eyes” that James’ breakthrough Asymmetrical Investing model generated for Strategic Investment readers. But most importantly, you will discover why most everyone will be looking the wrong way in 2019 and 2020. Because there is a cataclysmic event barreling toward the global economy that will ravage even the strongest… and reward investors who understand how this disruption will rip apart the lazy conventional wisdom. Because at one time you’ve been a loyal Strategic Investment reader, James wants to welcome you back into the fold with an unheard-of offer that includes a prediction so shocking that it’s potentially worth thousands of dollars… not the pennies per day that you will pay to learn its secret. His genius for farsighted clairvoyance… combined with what may well be his most shocking prediction ever… is why I am so thrilled to introduce myself to you as Strategic Investment ’s new publisher. It is a forecast that could be virtually certain to turn your small stake into a significant gain… it has nothing to do with pot or cryptocurrencies, both of which minted tons of Main Street millionaires in the past two years. Hello, I’m James DiGeorgia, and I am thrilled to welcome James Dale Davidson and you to my family of outstanding financial advisories. But, most importantly, every advisory I publish must adhere to one ideal… it is this: You cannot afford to lose money. My company’s advisories are cold-blooded about exiting positions at the first scent they may be wrong. Reputation is everything. It’s why I get to pick and choose who I publish. That unwavering focus is why when one of President Trump’s close press allies and Mar-a-Lago member, Christopher Ruddy found his investment newsletter publications in a rut; he brought me into the inner circle to energize them. But after a year, I realized I couldn’t run two companies… so I came home. But there was a huge bonus in my time at Newsmax. I got to spend a lot of time with one of its founders and member of its board of directors… James Dale Davidson. It turned out we were a perfect fit. It took a few months of negotiation, but now he’s joined my team, and I couldn’t be prouder. And, to celebrate this important moment, I’m going to make you one of financial publishing’s most fabulous offers ever. And, it’s an offer I’ll make only to former Strategic Investment readers… no outsiders. That’s why I put you on my Priority A-List. But, Even as a Priority A-List former subscriber to Strategic Investment who is aware of James’ near magical forecasting powers, there’s a bold prediction he made in 1999 that you may have forgotten about. 19 years later, investors are banking billions and billions of dollars in winnings because this forecast came true. In what may be the forecast of a lifetime, James Dale Davidson not only accurately forecast Bitcoin, he described it down to a T.
And it’s why his readers are cashing in today on cyber currencies and their underlying blockchain technology. Here’s what James wrote in his seminal book, The Sovereign Individual – which, by the way, still sells for full price on Amazon. Remember, this was in 1999; long before everyone had an internet connection. This is why it came as no surprise when late last year, on November 20, James suggested to his followers that they buy a cryptocurrency/blockchain stock of a company called RIOT Blockchain, which was trading at $8.06. During the next month, it quintupled – the best performing stock on NASDAQ. By December 20, RIOT closed at $40.75. That wasn’t his only mega-tend big winner last year. James’ followers rode the pot craze to huge gains, as well. Last Sept. 21, he posted an article called “How to Build a Fortune from Plagiarism and Marijuana.” The upshot was to buy shares in Scythian Biosciences, a Canadian company developing a cannabinoid-based drug treatment for concussion. Scythian then soared from C$1.50 to a split-adjusted C$14.40 – an 860% return. These were two more trades in a 30-year string of historic and accurate foresight. After all, in the mid-1980s, James was called crazy for forcefully forecasting the Soviet Union’s collapse. Critics, as they often are, were silent when the Soviet Union went under. Trump, the Peso, Bitcoin, and the Soviet Union; the Iranian Revolution, the Great Recession, and the housing collapse are just some of the important insights and forecasts Strategic Investment has shared with readers at crucial moments… they were investable truths that you couldn’t find in the clueless mainstream media and insights that eluded other newsletter writers. James forecast the collapse of the Japanese stock market, the rise of Islamic terrorism, the balance sheet crisis caused by the deflation of real estate values. His forecasts are why James Dale Davidson is a revered global economist. And it’s why he was recently invited to address the Financial Times CogX Conference in London. The invitation came because global financial leaders wanted to hear from a trailblazing economist about the future of cryptocurrencies and blockchain. Much to their surprise, James Dale Davidson also offered them a forecast… a prediction for 2020… of a massive global disruption that will be an investment and wealth creation event on the lines of Bitcoin, and legal marijuana. Everyone is looking in the wrong direction today. It’s why his investment ideas generally payoff so significantly… as with his recent record of 4,100% with the peso, 860% with blockchain, and 406% cannabinoids. And, now you have a chance to put this remarkable mind to work for you. Sometimes the best bet you can make in the markets is to stick with tried and true success… the kind that James Dale Davidson has delivered to tens of thousands of readers for the past 30 years. The markets are growing soft, interest rates are rising, global trade is suddenly unreliable… the historic bull is out of gas. The young financial writers have had a stunning 11-year bull market with which to inflate their reputations. They are not built for rocky times. But James Dale Davidson has experienced all the good and bad the markets can throw… heck, he rightly predicted just about all the good and bad that’s happened since 1988. This is why I am thrilled to offer you an exceptional opportunity to realign yourself with James Dale Davidson and his renowned Strategic Investment newsletter. This offer is only available to my Strategic Investment A-List of former Strategic Investment readers. When you accept this extraordinary offer, you’ll also receive immediate access to my six current Special Reports from my vast wealth-building library. FREE SPECIAL REPORT #1 The Global Mega Shocker: James Dale Davidson’s Direst Warning and How To Cash In On It Now – scary, scary, scary, scary, scary stuff waiting for an idea – A $29 Value… FREE. FREE SPECIAL REPORT #2 The Amazon of Blockchain – How one under-the-radar company could rule the world’s newest, hottest sector. This report digs deep into one of James’ top Asymmetrical Investing ideas… a hot, young, undiscovered company in a new mega trend. This report details the best way to time your entrance and exit, along with even more guidance on when we could expect big wins…and what outside scenarios could encourage short-term caution – A $19 Value… FREE. FREE SPECIAL REPORT #3 Crypto Babies: Three Tiny Cryptocurrencies Set to Take the World By Storm – The easiest way to enjoy the coming blockchain takeover of the financial world is to grab some hefty short-term gains on a basket of up and coming currencies. This report contains the three best crypto younglings out there today. These are riskier investments – which cryptocurrencies eventually break out is difficult to tell. But these are the best bets James has found – and they come with the enormous upside you find by accepting some increased risk – A $29 Value… FREE. 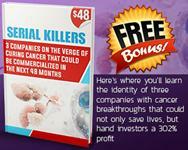 FREE Special Report #4 Serial Killers: 3 Companies on the Verge of Curing Cancer That Could Be Commercialized in the Next 48 Months – Here’s where you’ll learn the identity of three companies with cancer breakthroughs that could not only save lives but hand investors a 302% profit – A $29 Value… FREE. 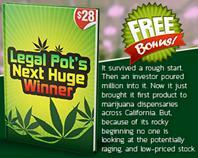 FREE Special Report #5 Legal Pot’s Next Huge Winner – It survived a rough start. Then an investor poured millions into it. Now it just brought its first product to marijuana dispensaries across California. But, because of its rocky beginning, no one is looking at the potentially raging, and low-priced stock – A $19 Value… FREE. FREE Special Report #6 Asymmetrical Investing: Contrarianism On Steroids – A brief history of Asymmetrical Investing, followed by actionable intelligence on how to apply it to your personal, business, and investing life – A $29 Value… FREE. 1. TWELVE MONTHLY ISSUES – Strategic Investment will be sent to you electronically by the first of the month. 2. WEEKLY UPDATES – Each Thursday, James Dale Davidson will keep you up-to-date on anything you need to know so you can be sure to make the right moves. The email updates cover a myriad of topics: the market, earnings reports, company updates, along with one-of-a-kind insight on investment opportunities and the global marketplace as only JDD can bring you. 3. CLEAR INSTRUCTIONS WHEN TO SELL – If it ever comes time to exit a position, you will receive a comprehensive update with the logic behind the sell order...and occasionally, a reason you might want to hang on a bit longer. 4. PROMPT, FRIENDLY CUSTOMER SERVICE –Based in Boca Raton, Florida–on shore, not outsourced– Strategic Investment ’s subscriber customer service is the gold standard in our industry. Our staffs of knowledgeable professionals are at their desks daily between 8:30 a.m. and 5 p.m. EST. 5. IRONCLAD, 100% RISK-FREE MONEY-BACK GUARANTEE -If at any time during your 3-month trial, for any reason you feel Strategic Investment is not for you, you may cancel for a full refund and keep your 6 FREE Bonuses valued at $218. 2018's No-Brainer of the Year! Few observers of the 20th and 21st centuries have their fingers so presciently on the pulse of the global political and economic realignment as does James Dale Davidson. His bold prediction of disaster on Wall Street in Blood in the Streets was borne out by Black Tuesday. His ensuing bestseller, The Great Reckoning , published just weeks before the coup attempt against Gorbachev, analyzed the pending collapse of the Soviet Union and foretold the civil war in Yugoslavia and other events that have proved to be among the most searing developments of the past few years. In his seminal book, The Sovereign Individual , James predicted in 1999 exactly what Bitcoin would be like and how it’s underlying technology, blockchain, would work! Every step along his distinguished career, James Dale Davidson and Strategic Investment has led farsighted investors to terrific returns. But thanks to Strategic Investment and James Dale Davidson’s breakthrough Asymmetrical Investing method, I am convinced that, depending on how you allocate your resources, the huge multiples you could earn with Strategic Investment will soon make your subscription fee seem like pocket change. Take This Easy Step; Subscribe Now! Simply fill out the secure order form below and you will automatically get 12 Monthly Issues. So all you’ll pay is $118.00 for 12 months of Strategic Investment – just $9.83 an issue! Please fill in the form below to purchase your subscription by credit card. After your purchase is approved, you will be given instant access! NOTE: Purchases can be made by the person named on the credit card ONLY! 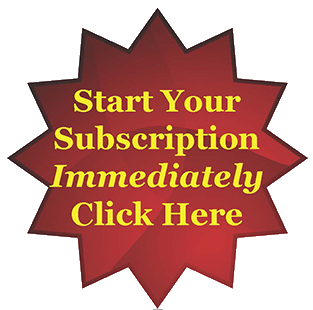 CHECK THIS BOX to indicate you have read and agreed to our Subscriber Agreement and our 100% Customer Satisfaction Refund Policy in order to become a Strategic Investment subscriber. *Past performance is no guarantee of future success. This offer is strictly limited to U.S. residents ONLY. Strategic Investment is published by Gold and Energy Options Trader, LLC. As a publisher of a financial newsletter of general and regular circulation, we cannot tender individual investment advice. Only a registered broker or investment advisor may advise you individually on the suitability and performance of your portfolio or specific investments. All profit examples are hypothetical, assuming that subscribers bought and sold at the time the recommendations were issued. Actual results can and do vary based on day of execution and commission charges. There is a very high degree of risk involved in trading. Past results are not indicative of future returns. Gold and Energy Options Trader and all individuals affiliated with Strategic Investment assume no responsibilities for your trading and investment results. ©2019, Strategic Investment, Gold and Energy Options Trader, L.L.C. All Rights Reserved.